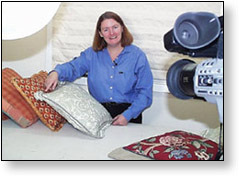 Chris Watt - "The Pillow Lady"
Clients know me as "The Pillow Lady" for my expertise in the construction of beautiful and unusual designer pillows. 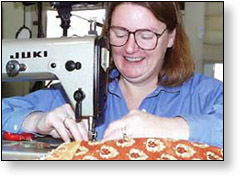 I've been a professional fabricator of drapery and home decor in San Francisco Area since 1976, making over 300 pillows a year. Now you can benefit from my years of experience by purchasing any of my Video DVDs. All the Video DVDs are professionally taped and edited. An important feature is the camera itself. 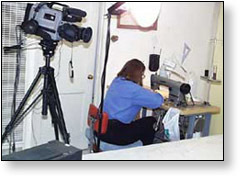 While I'm sewing, the camera is over my left shoulder so you can see what I am doing as I am doing it; like a private lesson in the comfort of your own studio. Each Video DVD covers different styles and details. 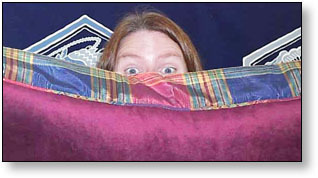 I show you how to make your own patterns so you can produce the size pillow you want. My forte is efficiency and I share with you all the techniques for a faster finished pillow, right the first time. Click on Video DVD titles below to learn more . . .